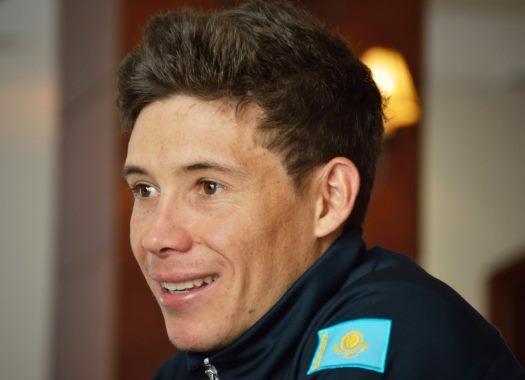 Astana's Miguel Angel Lopez has crossed in the second position the finish line of the 14th stage of the Vuelta a España. The Colombian climbed one position in the General Classification and he sits at 47 seconds from race leader Simon Yates. The rider was part of the favourites' group at the last climb of the day and after staying at the wheel of Nairo Quintana (Movistar), accelerated in the last metres to cross the finish line behind Yates. "Today I had a good opportunity to win the stage, but from the other hand, on the final climb I did my best and in that situation inside the last kilometre it was difficult to do something more," the Colombian commented. "I felt really good and I can say this climb suited me perfectly. But, also, my rivals were strong. "There were many attacks in our group and I tried to control it. For a few times I closed the gap, but, for sure, it was impossible to catch all moves. In the end, I counterattacked to try to reach Yates, but was able to finish second." Lopez took a bonification of six seconds and is in the fourth place of the overall standing. "Anyway, I can be happy with this day and with the way our team did it. I am happy I was up there in front with the other contenders. Tomorrow will be another day and another hard race. I hope to continue improving heading into the third week of the Vuelta. "There are still many opportunities to fight and a lot of mountains. Lagos is a climb that suits me a little bit better: it is longer and with a more sustained steepness, which makes it less explosive. At it will be long so I'm hoping to be in front."